PRESS RELEASE 15-11-2018 IT KIN NET. 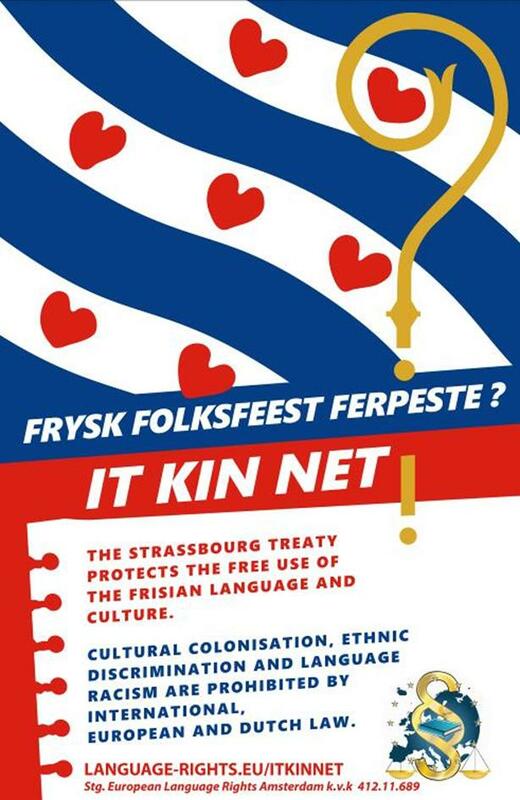 The foundation European Language Rights launched its “It Kin Net” campaign, which is Frisian for It Can Not. Purpose of our campaign is to rise the general public’s awareness about the undeniable right of the Frisian National minority of having an own identity. Through the ratification of the Strassbourg Convention for the Protection of national minorities the Netherlands is obligated to promote the conditions necessary for persons belonging to the Frisian minority to maintain and develop their culture, and to preserve the essential elements of their identity, namely their religion, language, traditions and cultural heritage. By law the Frisian minority enjoys protection against cultural colonialism, forced assimilation, ethnic discrimination and language racism. The European Charta of regional languages even broadens the legal protections, by ensure the free use of the Frisian language and to encourages its usage in public life. Legally Frisians are also subject to the principles of equality. The Principle of equality is also Subject to Frisians. On Friday November the 9th the court of Ljouwert ( Dutch : Leeuwarden ) will make judgment in the case of ethnic Frisians, who are charged with blocking an highway and of incitement. However in this case it seems, that the public prosecutor has failed to give equal weight to all circumstances of this case, since the Netherlands is obligated trough the Strasbourg treaty for the protection of national minorities to promote the conditions necessary for persons belonging to the Frisian minority to maintain and develop their culture, and to preserve the essential elements of their identity, namely their religion, language, traditions and cultural heritage. The ethic failure in Yugoslavia made to this treaty necessary, consequently it does not only protect the rights of ethic Albanians in Serbia and Macedonia, ethnic Hungarians in Transsylvania and Slovakia or that of Catalonians in Spain and France but also that of ethnic Frisians in the Netherlands. By law the Frisian minority enjoys protection against cultural colonialism, forced assimilation, ethnic discrimination and language racism. The European Charta of regional languages even broadens their legal protection, by ensuring the free use of the Frisian language and to encourage its usage in public life. The Sinteklaas ( Saint Nicholas ) tradition is just like speaking the Frisian language an inseparable part of the Frisian identity. The main suspect of this trail is charged with incitement, because she made a public statement in which she called for protecting the rights of young children to celebrate this tradition freely. She did this in the Frisian language. The principle of equality is violated severely in this case. Since the sentences requested by the general prosecutor lack any kind of proportionality with sentenced requested for comparable crimes within in the Netherlands. Besides this one can state that the principle of equality is also violated in an international perspective. Just image how the Dutch minister of foreign affairs would react, if nationalists on the Balkan would travel to a different ethnic area by a convoy of busses with the sole purpose to spoil the atmosphere of a folkloric and religious tradition of an ethnic minority. Besides this Frisian is the second official language of the Netherlands ( Frisian: Twadde Rykstaal) since the terrible events which happened during Truncheon Friday in 1951 (Frisian: Kneppelfreed ) , despite this the public prosecutor made a monolingual -Dutch language only- informational movie about this case, stressing the right to protest. Also a basic symbol of ethic equality between the Dutch and Frisians is missing at the courts of Ljouwert such as bilingual signs and stamps. Our foundation has been flabbergasted and shocked by public statements of Dutch journalists, who dared to publicly questioned the basic human right of using the Frisian language in court during criminal proceedings. This arrogance towards the language rights of Frisians dates back to 1948 when Frisians farmers had been sentenced for using the Frisian words of Molke and Supe (Milk and Butter Mild) on milk jugs . The current state of the position of the Frisians language is rather worrying, although it is the second official language of the Netherlands, not even a word of Frisian can be found in a Dutch passport, which is an evident violation of article 1 of the Dutch constitution, which prohibits discrimination. If you open a Dutch passport you can read “Kingdom of the Netherlands” in Estonian , which is spoken by less than 0.2 % of the Inhabitants of the European Unions, but not in Frisian. Also police cars and police uniforms are monolingual in Friesland, no Frisians language signs can be found at the court. Considering these circumstances it is more than questionable whether these ethic Frisians have had a fair trial. This is the English Translation of the article which appeared in the Leeuwarder Courant on the 9th of November.